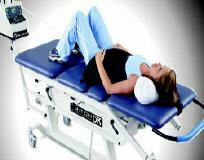 Our office uses special equipment designed to provide internal disc decompression utilizing the DTS Spinal Decompression system and/or the Flexion-Distraction method. These methods create negative internal disc pressure resulting in retraction of disc herniation or bulges and promote healing of the damaged area. This is the most advanced, scientifically researched non-surgical treatment for chronic neck and low back conditions. No needles. No knives. Just gentle, effective non-surgical treatment. For more information visit our page on "Spinal Decompression". This is a means of introducing passive motion into your spine for the purpose of increasing mobility and stretching spinal joints. The discs of your spine have a poor blood supply. Sustenance is accomplished and maintained through spinal joint motion. Proper spinal mechanics allow necessary protein nutrients to enter the disc. This also allows for the removal of waste, decreasing the likelihood of bone spur formation (degenerative arthritis). Misalignment of the spine prevents healthy functions. A lack of proper circulation can lead to disc thinning and degeneration of the spine. Intersegmental traction helps restore proper motion and prevent this from happening. This is the use of high frequency sound waves which increase blood flow to an injured area for increased circulation, reduction of pain and softening scar tissue. There are many different types of electrical stimulation for several different conditions. Our clinic utilizes most types including Sine-Wave, Galvanic, Interferential, Micro-Current and TENS (Transcutaneous Electrical Nerve Stimulation). All of these are painless forms of treatment. This is a compilation of gentle mechanical methods ranging from general hands-on manipulation to very light touch manipulation and adjusting. This involves accurately determining the exact direction needed for reduction of vertebral or other joint motion restriction or misalignment and then carefully manipulating the segments as needed for reduction of nerve irritation, pain and to improve function. These are techniques devised by Dr. Cohen himself, and include combinations of methods acquired at numerous postgraduate conferences and seminars. All techniques are based on sound neurological assessments and bio-mechanical principles. We are equipped for complete x-ray evaluation of the spine. Our equipment is modern and includes the use of special film and equipment to reduce exposure. Dr. Cohen has had extensive training in skeletal radiology and has taken and interpreted over 30,000 x-ray films. Your chiropractic x-rays reveal pathologies and degenerative conditions, help visualize the location of spinal problems, confirm other examination findings and make your adjustments more precise. This may include various forms of hands-on treatment plus combinations of physical therapy modalities. Most often trigger point therapy is needed in referred pain, numbness and tingling such as in the arm and hand or hip and leg and frequently in chronic headaches. Numerous exercise programs tailored to the individual’s specific needs are available and utilized as indicated. Dr. Cohen works with the patient to determine their exact needs based on their specific problem and general health. Recognizing that nutrition often plays an important part in a patient’s recovery, Dr. Cohen can provide specific, up-to-date nutritional information and recommendations for the patient to help them obtain better results and improve their general health. A gentle low force specific technique that is used when a low force technique is indicated, such as with young children and older adults. Dr. Cohen is a certified orthotist and he can design and fit orthotics for you specific needs. Dress shoes, casual shoes and all sports shoes can accept orthotics and proper fit means proper foot mechanics. This will ensure normalization of function and the restoration of your kinetic chain. Used to reduce pressure in the spine in conditions such as spinal arthritis, disc bulges, protrusions and herniations, facet syndrome, sciatica and more. Traction also is beneficial for intervertebral disc rehabilitation and for increasing blood flow to the soft tissue structures of the spine.